Thanks for visiting my web site! I am one of America's most widely recognized silhouette artists and I capture the profile likeness of my subjects in remarkable detail. As a nationally known silhouette artist with over thirty years of experience, I have been featured in newspaper articles and television shows and have lectured at art and educational institutions. I perform my silhouette artistry for nationally known department stores, children's boutiques, corporate events, schools, churches, and civic organizations. My studio is located in the Dallas, Texas, metro area and I am available for silhouette events at weddings, birthday parties, fundraisers and other occasions throughout Texas and surrounding states. Regardless of where you live in the United States, I can create silhouette portraits that you and your family will cherish. All I need is a photograph of the subject's face profile with the mouth closed and not smiling. I will then create an original silhouette portrait especially for you. 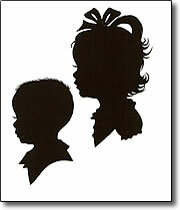 Children's silhouette portraits make wonderful gifts for family and friends and they are one of my specialties. You will receive an exquisite, individualized silhouette of the child. You can see examples of my artistry by Clicking Here. I can create customized silhouettes of adults, couples, pets, landscapes, multiple silhouette images mounted together on one mat, full body images, and a wide variety of other subjects in various sizes, shapes and colors. Pricing for my custom work varies depending on the features desired but my charges are very reasonable. Send an email to me at artistvirginiarose@verizon.net indicating the subject, size, color and other details that you desire and I will send you an estimate of the cost. Silhouettes…the Perfect Gift for any Occasion! Silhouettes are perfect gifts for Weddings, Christmas, Valentine’s Day, Mother’s Day, Father’s Day, Graduation, Bar Mitzvahs, Bas Mitzvahs, Church and School Fundraisers, Corporate Events, Civic Functions and other special occasions. Except for periods of high seasonal demand, such as before Christmas and Mother's Day, I can complete most orders within approximately 10-14 days after I receive your order. If you are ordering for Christmas or Mother's Day, please allow a minimum of 3 weeks from the day that you submit your order to its completion. 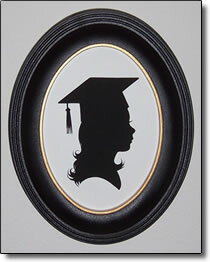 Attractive, artistic 5” x 7” frames, specifically designed and sized for silhouettes, are also available. Your silhouette can be shipped to you in a black, gold trimmed, molded acrylic oval wall frame ready to display (see example of a framed silhouette at the left). Enter the number of frames desired on the Order Form. Orders will be shipped via U.S. Mail. Contact me if you need to arrange for an expedited shipment of your order. You can use either of the following convenient and easy-to-use ordering procedures. Click Here to order by U.S. Mail. Click Here to Order Online. Your satisfaction is guaranteed or you will receive a full refund.